To be celebrated as the greatest and most successful footballer your home continent has ever produced would induce great pride in any individual. When that same individual places their European Medal of Tolerance Award for their continuing stance against racism higher than their every other accolade, it gives you a sense of the person and what they value. It signifies an individual who recognises the power of football and the subsequent responsibilities vicariously afforded to its protagonists. Samuel Eto’o is a man who is widely regarded as the greatest footballer to come from Africa. He is the talisman who led the Indomitable Lions to continental success over a 17-year international career, securing a prolific haul of records and individual honours along the way. A man who came to the world’s attention playing in arguably the greatest ever club side and whose story incredibly starts at the home of their most bitter rivals. In 1997 Real Madrid signed a 16-year–old Eto’o and, with his being classed as a minor, immediately placed him in their B-team, Castilla. The young striker’s career never had a chance to develop in the Spanish capital and he was eventually sold to Mallorca for a club record £4.4 million. During his time in the Balearics, Eto’o scored 70 goals in 165 games and secured his first club honour, winning the Copa del Rey; scoring twice in the final to secure a 3-0 victory. Eto’o was just beginning to attract attention from the bigger clubs in La Liga when perhaps the biggest of all at the time came calling. Barcelona purchased the Cameroon international for €24 million. The years spent in Catalonia would see Samuel Eto’o become a global superstar of the game. A hat-trick of La Liga titles and another Cop del Rey title arrived at the feet of the now prolific striker but, even better, were the two Champions League titles that followed, Eto’o again proving pivotal by scoring in both the 2006 and 2009 finals. In the 2006 victory over Arsenal, Eto’o was awarded the man of the match after an outstanding performance which left the Gunners’ defence ‘breathless’. The 2009 Champions League victory against Manchester United saw Barcelona secure a historic treble, with the holy trinity of Messi, Henry and Eto’o scoring 100 goals between them that season. Despite the silverware, Eto’o’s time at Barcelona was not without controversy. Manager Frank Rijkaard complained about Eto’o not wanting to play when coming back from injury, as well as instructing his striker to simply ignore the racist chants he was being subjected to at Real Zaragoza in 2005. Following a repeat of the incident the following season again at Zaragoza, Eto’o wanted to leave the field of play only to be persuaded to return by his teammates. For Eto’o, the incident prompted him to stop his family coming to support him for fear of the abuse upsetting his children. Eto’o was eventually sold to Inter Milan as part of the deal that brought Zlatan Ibrahimović to the Camp Nou, and in his first season with the Nerazzurri, he picked up exactly where he had left off with Barcelon; firstly securing the Scudetto with 12 league goals, then winning the Coppa Italia, and finally becoming the only player in history to secure two trebles in consecutive seasons by winning the Champions League trophy once more. A Club World Cup and another Coppa Italia success followed for Eto’o while playing with the Milan side. But again, the ugly issue of racism reared its head as the African striker was subjected to crowd abuse during a Serie A fixture at Cagliari. This time the referee momentarily stopped the game to quieten the crowd. Inter eventually won 1-0, Eto’o appropriately scoring the winner. After Inter, Eto’o continued to ply his trade in the European leagues. A move to Russian side Anzhi Makhachkala saw the striker momentarily become the highest earner in football. Subsequent moves to English clubs Chelsea and Everton never brought the best out of Eto’o before the striker moved to the Turkish top-flight to ply his trade with Antalyaspor. Perhaps it is the fact Eto’o never played in his home country’s domestic league which drove his ambition and will to succeed for the national team. In 2000, Eto’o led his nation to Olympic Gold in Sydney and Africa Cup of Nations success. Eto’o was also named Young African Footballer of the Year in that same year, all while still only 19. A second Cup of Nations success followed in 2002 while Eto’o went on to play in four World Cups and six Cup of Nations. He was named African Footballer of the Year a record four times and is his nation’s all-time leading goalscorer with 56 strikes in 118 appearances. 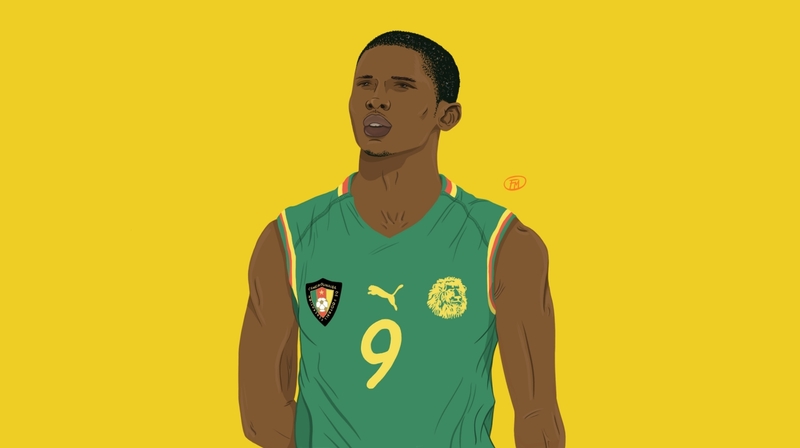 Samuel Eto’o will always be remembered as one of Africa’s greatest ever players. His goalscoring exploits allowed him to achieve a collection of winners medals that ranks alongside the very best players, along with a number of individual honours and records. In addition to being his country’s greatest ever player, it will be the principles of the man that shall endure the longest. Samuel Eto’o: footballer, goalscorer, winner and humanitarian.